Amana washing machine owners enjoy affordable machines with effortless, hassle-free features. Shouldn’t you be able to expect the same from your Amana washing machine repair service? 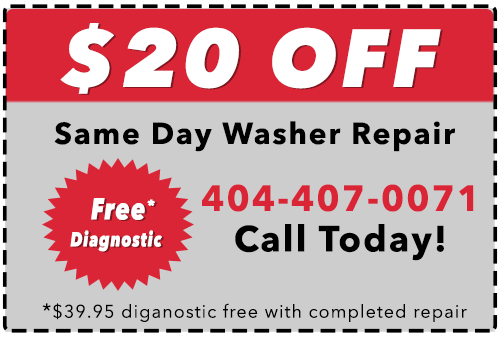 We are the number one Amana washer experts in the Metro Atlanta area. We have the gear and know-how to make sure your service experience is quick and easy. We’re on-call with same-day appointments seven days a week so we are always here when you need us. With our low prices and garanteed service, there’s no reason to wait. Call or book online today! 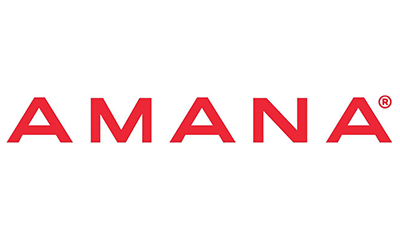 If your washer has an error code, check our troubleshooting guide below or print out our Amana Washing Machine Error Code Quick Guide to find the fix fast. After resolving the issue causing an error code, you can clear the error code by pressing the “Start” or “Pause” button twice. If this does not clear the error, unplug the washing machine from the power for 60 seconds. Plug the machine back into the power outlet and allow the machine to restart. If the error persists, contact an Amana washer repair service for assistance. Ensure the detergent cartridge is in the machine. Remove the cartridge from the machine and reseat it in the appropriate port. Close the dispenser drawer firmly. If the message persists, there may be an issue with the machine control panel or wiring. The washing cycle was interrupted. If the washing cycle is paused or cancled, your machine may take up to 30 minutes to cease spinning and drain. This error message displays until the washer is safe to open. To clear the error, press the cancel or pause button two times and the power button once. If the error does not clear, reset the washer. The Clean Washer cycle cannot complete due to items in the washer. Some models of Amana washers have a “Clean Washer Cycle” to help your washing machine stay fresh and mildew-free. Cleaning the washer requires the washing machine tub to be empty. Remove clothes and other items from the washer and restart the Clean Washer cycle. The machine detected too many suds in the washer drum. Although it may seem as though more suds = cleaner clothes, your Amana washing machine can’t work properly if there are too many suds. To fix the issue, your washer runs an extended rinse cycle to clear the excess suds. Your washer may also pause and add water to the rinse cycle several times. The pause allows the bubbles to break, reducing the suds. Only use High Efficiency (HE) detergent in your HE washer. Only use regular bleach products. Avoid “No Splash” or “Easy Pour” varieties. If you are using the correct detergent and bleach product and still see excess suds, you may have a problem with clogged drain hose. Check out our article for a washer that won’t drain for additional support information. The washer door or lid can’t lock. Clear the area around the door or lid and verify that it is closed completely. Inspect the locking mechanism for buildup. It may help to open the door and close it firmly. 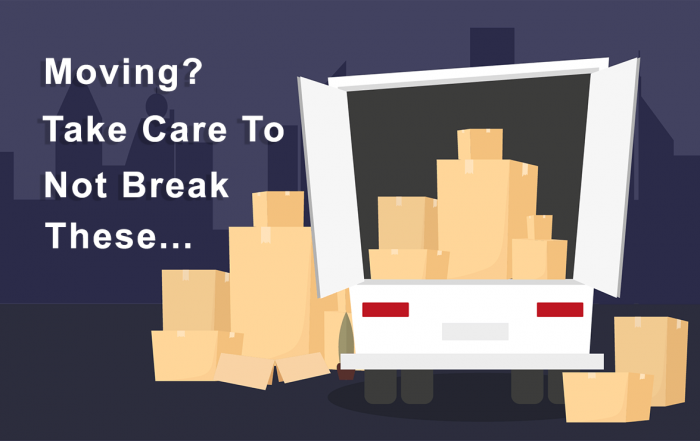 If the door or lid still won’t lock, there may be an issue with the wiring or control panel. If you have a top-loading washer, remove any objects from the top of the machine. Additional weight may prevent the lid from locking. There is a speed issue with the motor. The revolutions per minute (RPMS) your washing machine spins at is determined by the settings for your wash cycle. Most washing machines spin at 800-1600 RPMS. If the washer is new, verify all the shipping bolts have been removed from the machine. Remove heavier items from the washing machine. The washer may be overloaded. Check our troubleshooting guide for a washing machine that won’t spin. On an older machine, there may be an issue with the motor coupler, clutch, or drive motor. The washer lid can’t unlock. 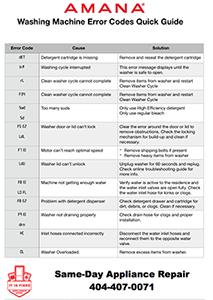 Check our detailed troubleshooting guide for a washer that won’t unlock. Try to use the water from a different source to verify the main water to the house is on. Ensure the water valves connected to the washer are fully open. Inspect the water inlet hose for kinks or clogs. There is a problem with the detergent dispenser. (Select models) Inspect the detergent drawer and cartridge for dirt, debris, or clogs. It may be necessary to clean the dispenser drawer. The washer is draining slowly or is not draining properly. If your washer is draining slowly or not draining at all there may be an issue with a clogged or improperly installed drain hose. Additional causes include equipment failure. Check our troubleshooting guide for detailed repair instructions. The inlet hoses are not connected correctly. Your washer has a hot and cold inlet hose. These are not interchangeable. If you see this error, the hot water hose is connected to the cold water valve or vice versa. Turn off the water supply valve. Disconnect the water inlet hoses and reconnect them to the opposite water valve. Pro Tip: Wrap a piece of duct tape around the cold water inlet hose, so it is easy to identify in the future. The washer is overloaded. Overloading your washer can cause many problems. Your clothes may not get clean, the washer may leak, and it puts additional strain on the internal components. If the washer detects a load that is too large, remove a few items from the wash basin and restart the wash cycle.